While I feel I could ease into life as a gringo Porteño here in Buenos Aires, I’ve got to get down to business. Certainly there’s coordinating the logistics of shipping Doc to Cape Town in South Africa. And there’s the problem with my Apple Mac Book Pro. I want to be sure to spend time with my old friends while in town, too. With regard to the Mac Book Pro. Before leaving Belém I considered flying first to São Paulo and getting my computer serviced in the second largest city in the world. I reasoned that if the part for my computer could be found in South America, I in correctly assumed São Paulo would be my best shot. However after e-mailing and phoning each Apple authorized service center in the city and surrounding, I was out of luck. Figuring the LCD screen had failed, nobody could verify that there was a 15″ LCD in the city. One service center quoted me 1-2 months while still another said he could get it in two weeks, but I should plan on a month. I cut bait and hoped that I could find the part in Buenos Aires. I contacted a half-dozen service centers in my favorite South American city. One said that the longest it could possibly take was 5 days, but my contact was fairly confident the part was local and he could fix it in 1-2 days. Wow. So on my way to Mac Soul (Avenida Santa Fe 1780, 13th floor – highly recommended) I noticed the modern and massive MacStation just around the corner. The folks at MacStation had neglected to return my e-mail, but I figured why not drop in and see if I could simply get this handled there. Bad idea. When I asked the receptionist in the service department if she could tell me the part number for the screen that I needed for my display she shook her head and told me she was not authorized to release this information. “What? !” This is public information and available on Apple’s website, I explained. She was adamant. There could be no information released to me regarding part numbers or availability. The representative I finally convinced to at least try to help me informed me that there was only a “glossy” 15″ LCD screen available. I’ve got the matte screen on my computer, though he indicated that they could change the screen in a day if I wished to change to the glossy. I pained myself with this decision. It wasn’t the perfect solution, but at least I could start working again. Then I decided I should just continued down Santa Fe and talk to the folks at MacSoul. 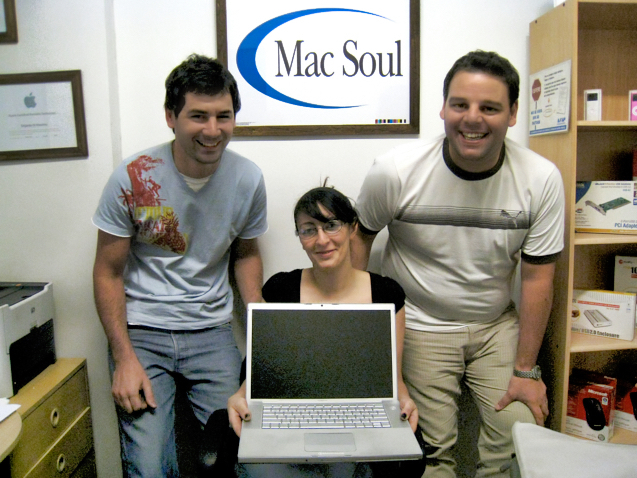 Rodrigo (l) and the team at MacSoul in Buenos Aires with my MacBook Pro good as new! At MacSoul I took the self-service classic elevator to the 13th floor, remarking to the folks up there that in the US buildings rarely had a floor numbered “13”. Rodrigo at MacSoul told me the part would be there the following day and that I should return in a day or two. When I did Rodrigo had good news and bad news. Turns out the problem with my computer was not the display. He changed the display and it still wouldn’t light up. Turns out the video circuit on the motherboard was bad so the motherboard needed to be changed. He’d have that part the following morning and I’d be ready to go. These guys were so nice, efficient and did the work fast and completely under Apple’s WorldWide AppleCare warranty. If you need anything Apple, including iPods, accessories or computers don’t get sucked into the gloss and fancy displays at MacStation or any other retailer in Buenos Aires, visit Rodrigo and the gang at MacSoul – they will treat you right. My motorcycle should arrive any day from Buenos Aires and I’ve been anxiously awaiting a return phone call from Sylvina at Delfino Air Cargo as to the process of transiting my bike from Variglog to Malaysia Airlines for shipping to Cape Town, South Africa. There are two flights weekly from Buenos Aires to South Africa – Sunday and Wednesday. As soon as I know that my bike is cleared for shipping across the Atlantic, I’ll purchase my ticket. If I’m lucky, I fly the same plane with Doc to the African continent. Friends & Family: Buenos Aires Wine & Food in Buenos Aires: One More Time.